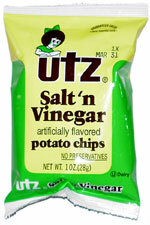 Taste test: These vinegar chips have some zing. The vinegar definitely overpowers the potato taste, and it overpowers the salt too, so your whole mouth tastes like vinegar. A nice chip. From the package: Ingredients include lactose, malic acid and fumaric acid.